Smart LED Dashboard: Instant feedback on heat and charging for optimal use. An audible alert sound if the unit is getting too hot. Here I have the BioLite KettleCharge. It is a kettle with a power generator and how it works and what it can do you see now in the article below. 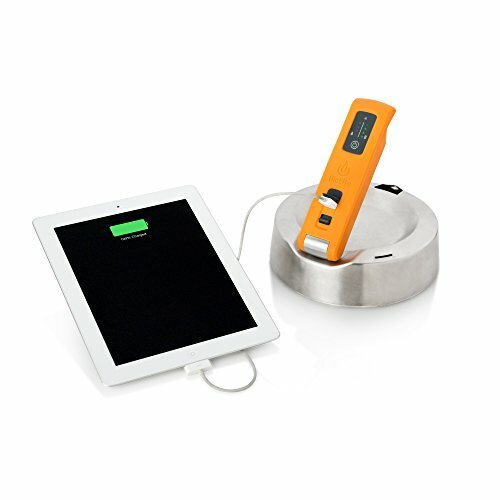 The Kettle Charge works with a thermoelectric generator which generates electricity by temperature differences. If you want to know more about it, click here. It generates power for USB loadable small devices with up to 10 watts (5V, 2A). The Kettle Charge can be used with all types of controlled flames. Larger fires that leap up over the edge, can damage the device. The best way to use the kettle is on a gas stove with stable stand. Although it also works on a hobo, a alcohol stove or a smaller fire. However, these variants are not very efficient, and because uncontrolled flames are not recommended. The operation is quite simple. Bring the power handle in a upright position until the lock engages. Then fill the tank through the filler opening up to the maximum edge with water. (750ml) Fill the Kettle Charge before you place it over a heat source and not vice-versa. In addition, the kettle may only be filled with water. 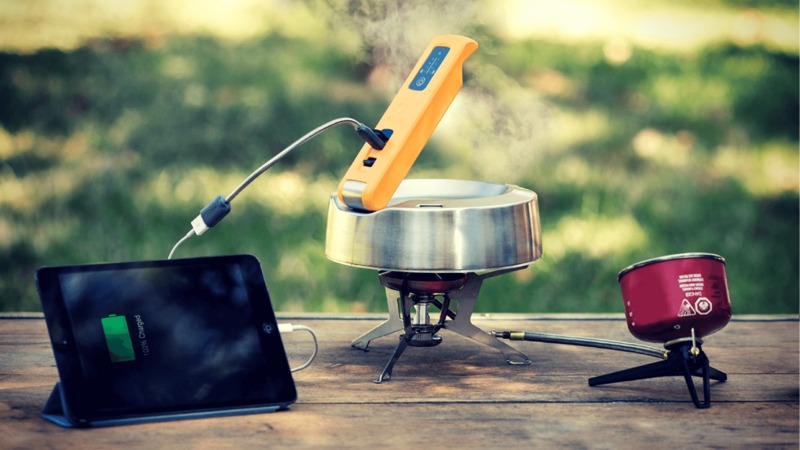 If the kettle is placed on the heat source, it starts to charge the built-in battery (1250mAh / LiFePO4) .The charging status can be read right on the power grip. One LED is 25% of charge capacity. The left side with flame icon shows the strength of the heat source. Ideally it shows 4 points. To prevent overheating and damage to the electronics. The KettleCharge has a built-in warning system that visual and audible warns you when the unit is too hot. For example, if the upper left LED flashes it means that you nearly reach the upper temperature limit. If the triangular LED starts to blink and you hear a repeating beep, the flame is too hot and the heat source must be down regulated. The beeping should stop within a few seconds. If the triangular LED lights up with a permanent beep, it shows the water is almost vaporized. With the power button you can temporarily disable the audible warning. If you take no action, the KettleCharge can be permanently damaged. When the battery charge capacity gains you can use the supplied fireproof flexible extension cable to charge your device. Simply remove the rubber cover of the USB port and plug the extension. I have used an iphone and ipad and it worked without any problems. The loading speed is identical to an AC outlet. After use, you can use the hot water for your tea, coffee or something similar. BioLite recommends to handle the power grip during use with a glove or similar protection. But the handle has not become very hot. The base plate is very hot after use, however, so watch out where you will set aside the kettle. For faster cool down you can fill it with cold water. To make the KettleCharge ready for transport after cool down, simply release the lock and fold. With the battery charged, you can load your device on the move without water and fire. Simply connect to the device and press the power button once. The Kettle Charge weighs 907g and is therefore not lightweight. The dimensions are not particularly small. When it is folded it is 7.4 cm high and has a diameter of about 19cm. The base plate is made of steel and the kettle is stainless aluminum. The power handle on the other hand is a stable and heat-resistant plastic. Now we come to the conclusion. I like the Kettle charge very well. Of course, now many think in nature you don’t need something like this etc. But for longer trips without electricity or simply to use energy useful. I think the device is really good. Also, I imagine something like this is good in the developing countries, where the electricity grid does not get there everywhere. With my iphone 7 I could charge to 80% with a filling in normal operation. This obviously varies depending on the temperature, battery age, etc. Just as a small clue. What I did not like was the sensitivity of the electronics against moisture and wetness according to instructions of the manual. I think when a device is used with water that should not be a problem. The size and the weight I think is not so bad, because such a device is only used stationary or in a group and there everything is well divided. Hey, I'm Gabe and I am a 36-year-old Prepper.I'm a former military man who has proudly served his country both in the US and Overseas. I started this website so i could give back some of my knowledge about prepping that i have learnt over the years. Read more about him.